I've followed the work of Dan Parson for the better part of a decade now, ever since I first ran across him hawking copies of his creator-owned series, Harpy, at a Mid-Ohio-Con in the early 90s. Often dismissed as "just another bad girl book", Harpy really intrigued me and drew me into its world. And one of the things that kept drawing me back to the series -- sometimes just to sit and thumb through issues, stopping to admire a page at random -- was Parsons' incredibly lush and luxuriant ink work. There was not just a weight and gravity to the work, but a real sense of texture and ... reality ... that graced those pages, a sense of life which provided firm grounding for even the most fantastic of plot devices or twists. Sadly, Harpy was unable to sustain itself. However, the ever resourceful Parsons soon retooled himself from a "does it all himself" auteur into an ace inker, and found himself a regular slot as the inker of Jan Duursema's pencils for Dark Horse's popular Star Wars line of comics. Recently Parsons took a few moments to talk about landing this plum assignment, playing with the Skywalker mythos, his current plans for Harpy and much, much more. Bill Baker: How'd you get this particular gig, and why did you take it? Dan Parsons: How I got started on Star Wars? I met Jan Duursema down at the San Diego Comic Con. She liked some of the realistic illustration type pieces I had done recently for Dynamic Forces trading card sets - Lexx, Witchblade, BOTP, etc. I inked a couple of sample pages for her and we've been working together ever since. My obsession with ink and its place at the heart of comic book illustration also may have made me jump at chance to focus on inking. BB: Does working on books with nigh-iconic characters still give you a "geek out" moment now and then, or has all that glamour kind of worn off for you? DP: Yeah, my "geek within" is always exerting a powerful influence. I am an old school Star Wars fan from way back and it is an honor to work on the book and be a part of the Star Wars family. BB: How's a typical issue built with this team? Do you have much input in how the story's told? DP: As an inker, I really don't have much input on how the story is told. I think John Ostrander and Jan work pretty closely on that. BB: What makes Jan Duursema so much fun to work with? Is it just her strong rendering and storytelling skills, or is there more to it than that? I ask, because it seems that you're really pushing each other to try out new things, new techniques. DP: Yeah, Jan is great to work with. I think a lot of that has to do with not only her vast knowledge but her willingness to try new things. We have been trying a lot of different things. 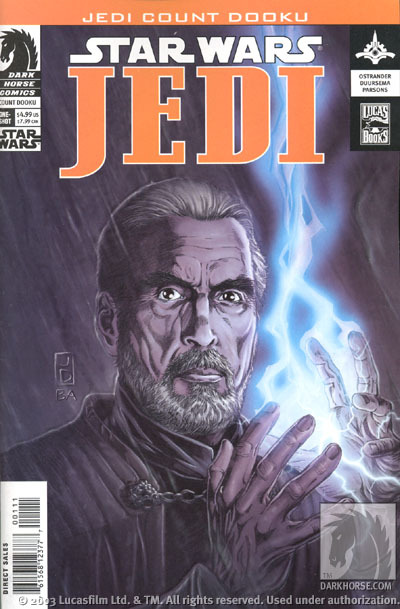 Dooku was really a culmination of this multi-media approach. We have been getting such a positive response from Dooku, we are going to try keep this experimental approach to some extend. The book I am working on right now, [SW:] Republic #66, has some cool unexpected stuff going on. I can say that Jan is the real mastermind and she is always surprising me with new suggestions on how to approach things. BB: How about the colorist, Brad Anderson. What does he bring to the table that makes him stand out as a collaborator? DP: Brad is a superlative colorist. He really knows what he's doing in the realm of digital coloring. He has a great knack for taking what Jan and I have done, even if the page may contain fully rendered pencil, ink wash and hard line ink and making the transitions smooth, sensible and interesting. I think we have a great team working on the Star Wars books. BB: What do you get, both professionally and personally, from doing this kind of work, as compared with your creator owned efforts? DP: Well, for one thing, I really like collaborating with other artists. I think something unique and powerful comes from combining ones skills to a common end. I enjoy working on my own creator owned projects but I am really enjoying the opportunity to focus in one aspect of the comic book creative process and make it the best it can be. Inking is a world within itself. BB: Speaking of your own stuff, you recently released an art book, Age of Fantasy: The Art of Dan Parsons. How'd that opportunity come about, and what aspects of your work did that allow you to showcase that you might not have been able to feature in your other books? DP: The Artbook is one of the last things in a series of things that were coming out from Amyrl Entertainment right before I started working on the Star Wars titles. It is a collection of all types of artwork I have done from many of my creator owned projects and other places. The thing I really liked about the Artbook was that I was able show a lot of unpublished personal art. Most of that stuff has what I guess you would call a Conan-style ancient warrior feel. Of course there is plenty of the 'Parsons Girl Art' in there too. BB: How about Savage Planet? How'd you get involved in with that book, and what did it allow you to do that you hadn't tried before? DP: Savage Planet was a project I always wanted to do. I guess you could say that it is a case of the 'Geek Within' running rampant. I was always enchanted by the classic sci-fi fantasy of Edgar Rice Burroughs and the movies of Ray Harryhausen. I think Savage Planet pays homage to that obsession. Two issues came out before I began working on Star Wars. Half of issue 3 lies dormant in my portfolio. BB: I'd be remiss if I didn't mention Harpy. What's going on on that front at present? Is there a possibility of seeing her in some new adventures in the future? DP: I stay pretty busy with Star Wars, so not much time for Harpy or the other creator-owned projects. I had 9 pages of a 10 pager ready to go when I started working on Star Wars. Most likely that 10 pager will make its way into Avatar's Threshold. Harpy stories have been serialized in Threshold since the first Harpy: Prize of the Overlord miniseries. BB: Well, what do you have going on in the future? What's coming out next, and what's in the works? DP: I hope to continue inking the Star Wars titles for Dark Horse. I enjoy focusing my energies on inking and I am learning a lot. 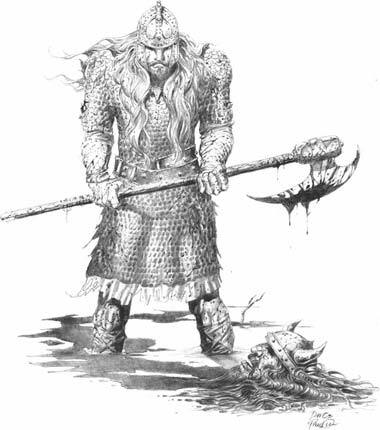 If ever got a chance down the road, I would like to do an EC/Warren style book featuring stories about ancient warriors and historical events. Of course, I would probably be the only one reading it, so I think I'll stick with Star Wars! BB: What do you hope readers get from your work, be it your contributions to the Star Wars mythos, or your own creations? DP: What I hope readers get from my work, whether it be Star Wars, or one of my own stories, is a sense of wonder and mystery. This is the thing that inspired me to become an artist. I hope it inspires others. BB: Anything else you'd like to say? DP: Well, I hope folks continue to check out the Star Wars comics. Things are really starting to get gritty with the story. They are exciting to work on and I think it will show to any one who picks up a book. And if anyone wants to check out my other work they can check out the Amryl Entertainment website at www.Amryl.com. To discover more about the life and work of Dan Parsons, go to www.Amryl.com. 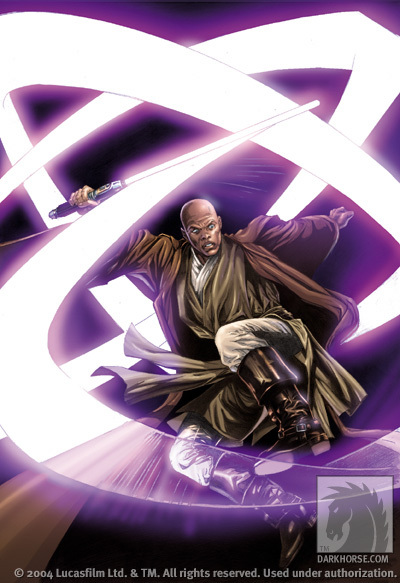 For updates on Dark Horse Comics various Star Wars titles, head on over to www.darkhorse.com.